Good morning everyone! A very quick CAS design for today. 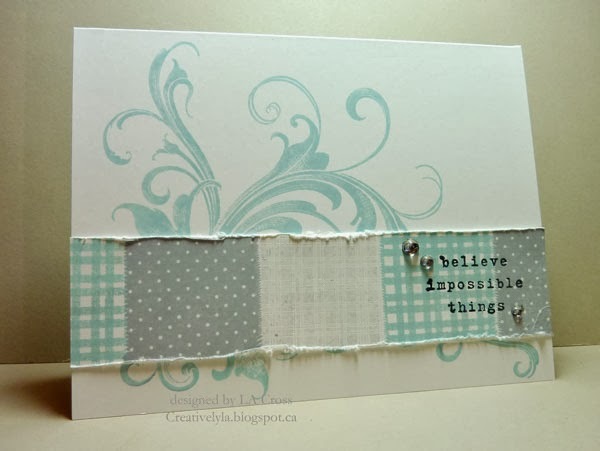 My card is a standard 4.25″ x 5.5″ and it’s been stamped with a flourish in Hero Arts Shadow Ink. Then I stamped the various patterns on a strip of card stock in two shades of the Hero Arts inks and created the lighter gray shade by stamping off. A simple sentiment, some distressing, and a few rhinestones and done! What a beautiful design…love the flourishes in the background and what a great way to add the sentiment!!!! Thanks for stopping by my blog and leaving such a sweet comment….have a wonderful weekend!!! You're quilt strip looks so pretty with that lovely flourish background, Lee-Anne! Love the strip of patterned papers and the flourishes look fabulous!! Thanks for joining us at CTD!! beautiful colors and design. great card! thanks for joining us at CAS-ual Fridays! First, I am in love with the sentiment. I think I might need that stamp! Second, the strip of stamped patterns–wow. That is awesome! Thanks for joining us at CAS-ual Fridays! I do find your sentiment so inspiring. the distressed edges is my favorite part. When I am in a rut with a card, I distress the edges and it seems to make it better. So more distressing for 2014 too!! oh…forgot to say Thanks for playing CFC! Previous Previous post: what 29 again?